When something goes wrong with our cars, there is usually a light that comes on the dash to tell us. If we are low on oil or are overheating, a light comes on. We can also tell if something is not right with our cars by sound too. The engine revving too high or low just doesn’t sound right, nor does the sound the one tire is making. But what about smell? Can you smell car trouble? In the words of Daniel Bryan, the answer is Yes! Yes! Yes! Here are 6 ways to spot car trouble with your nose and hopefully save you some money by fixing things early. Unless you were just drag racing some crazy guy in a Frakencaddy at the stop light, the smell isn’t your tires. It’s most likely a loose belt or a slipping belt under your hood. The smell comes from the belt slipping or rubbing against something else. In some cases, this is an easy fix that you can do, but other times, you need the right tools to make sure the belt is on tightly enough. One word of caution though, don’t just reach into a hot engine bay. Those belts (and the engine) can easily burn you! The most likely culprit is a gas leak somewhere. While the leak can be anywhere, it is important to have things checked out right away. 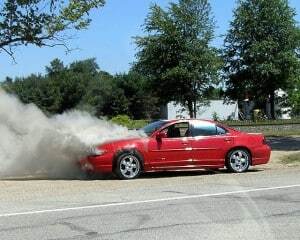 Any gas leaking onto a hot part of your car is not a good thing. While you won’t be leaving a trail of fire behind you like the plane in Die Hard, it is still a dangerous situation. Odds are here you have an oil leak. There are a few things you can do to verify this. The easiest is to look at the pavement under the engine of your car whenever you leave a parking spot. Just look for a fresh oil spot. The key here though is to look before you pull in too. I had an old Volkswagen Golf that was leaking oil. I didn’t check the spot I pulled into once and when I came out of the store, I noticed a huge oil slick under my car. I thought my car was toast. I checked my oil level on the dipstick and everything was OK. It turns out the oil was there from before I pulled in. Don’t give yourself a heart attack like I did, look before you park! One more tip, know that when you run the air conditioner, the water condensation will drip from your car. So during the hot summer months, you will see a puddle under your car and even a trail of drips too. Don’t be alarmed. Either you have an exhaust problem (the car does, not you, unless you just ate at Taco Bell) or someone is playing a mean trick on you. Most likely though it’s the exhaust. Many times the catalytic converter will fail or the engine not running properly will cause the catalytic converter to have issues. While not a major issue, it is something to have looked at. Most times this smell comes from overheating brakes. Seeing as how you need your brakes, it would be a wise choice to have things looked over ASAP. It could be a simple fix like you forgot to take off the parking brake, to something more serious like failing brake pads. When I say a sweet smell, I am talking about a smell like syrup. If you have the urge to eat some pancakes or french toast every time you drive your car, you may be leaking anti-freeze or engine coolant. The leak could be anywhere in the engine compartment, so it is best to have a mechanic look things over. You should however check the coolant level. You don’t want your car overheating and doing more damage by ruining the engine. But, don’t open the radiator when it is hot! If you do this, hot liquid magma will explode all over the place, causing you serious burns. OK, it’s not magma, but it is super hot and will shoot out everywhere. Be careful. In the end, you can spot car trouble with your eyes, ears and your nose. Who would have thought? The important thing is to remember what smells or sounds are major issues that compromise your safety and have them checked out and fixed immediately. Not only are you risking your life, but the lives of other people if your car breaks down and you lose control of it.